Gum disease plagues millions of Americans. 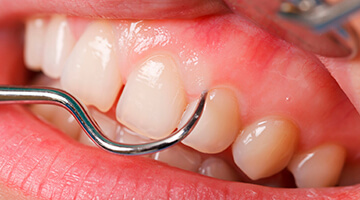 The end result of gum disease is often the loss of teeth. At Matthew Nawrocki DMD, MS, we understand the implications of proper gum health and as a result strive to maintain optimal oral health for all of our patients. Healthy teeth and gums are our mission! There are many forms of gum disease. There are, however, two main presentations. Gingivitis is the most common form of gum disease. Symptoms of gingivitis include reddened and swollen gums, bleeding when brushing or flossing, persistent halitosis, and painful gum tissue. The primary cause of gingivitis is plaque. As plaque builds up, our bodies recognize that there is a foreign invader and as a result launch an immune response. This immune response, inflammation, will nearly always persist until the problem has been corrected. When gingivitis progresses, it can become periodontitis. This is the immune response's next step. With periodontitis, the attachments for the teeth begin to be lost. This loss of supportive structure continues and can destroy the soft tissue as well as the surrounding bone. Periodontitis is a very common reason for tooth loss. Gum disease should be treated as early as possible to avoid tooth loss and irreversible damage. Often the treatment for gum disease is as simple as a professional cleaning. Your hygienist can remove debris, plaque, and calculus that the toothbrush cannot. Often, a change in habits after the cleaning can allow for optimal results. Gum disease that has progressed to the further stages of periodontitis often requires more aggressive treatment. This includes a deep cleaning, laser treatment, or surgery. Dr. Nawrocki has been trained to diagnose and treat gum disease. If you believe you have gingivitis or worse, we encourage you to contact us at any time for a complete consultation.